Frequently I keep getting questions pertaining to alcohol. Most of the questions come from men, because guys like a tipple, every now and then, at least in the Indian sub-continent. Since health is an important issue the most frequent questions relate to type of alcohol and the quantity and frequency permissible. Let’s look at some of the things that are generally known and not known about alcohol. Alcohol has been consumed by humans since ages for a variety of hygienic, dietary, medicinal, religious, and recreational reasons. Metabolically it is known to contain “empty calories”. That because alcohol provides 7 cal/gm but it does not provide any energy. In fact one becomes sluggish after consumption. If it did provide energy, more and more people would have been on an alcoholic diet. So let’s take a brief look at what happens to alcohol once in the body. Let’s face it guys, alcohol is toxic (poisonous). As a toxin it takes metabolic priority in the system as the body must immediately get rid of it and out of the system as soon as the sin is committed. The liver gets down to the job with the first sip and is completely busy until the last of the toxin has been metabolized. So one of the preliminary problems this causes is that a lot of the other nutrients get bypassed and will exit the system without getting absorbed, because the system was busy. This is the primary reason that diabetics find their BG numbers lowered with alcohol, because most of the carbs get bypassed as above. ‘Drinking-alcohol’ contains ethanol or ethyl alcohol and is also sometimes referred to as ‘grain alcohol’. As mentioned in several places on the blog, our nutrients get broken down to a 2-carbon substance known as Acetyl-CoA which enters the ‘Krebb’s cycle’ of reactions where it is converted to ATP, the form of energy we use. This cyclic reaction is made possible by oxidation-reduction reactions and continuous electron transfer which utilize oxygen, hydrogen and micro nutrients like vitamins & minerals. To get converted to Acetyl-CoA, the ethanol must first be converted to acetaldehyde. Hereon, the conversion to Acetyl-CoA uses either of 2 pathways. ADH (alcohol dehydrogenase) if consumption is moderate or the more rapid MEOS (microsomal ethanol oxidizing system) if consumption is more. 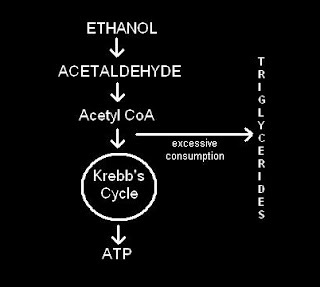 In the Krebb’s cycle process a vitamin B3 (niacin) derivative is constantly changing form from NAD to NADH (oxidation / reduction) & vice versa. With ethanol (alcohol) the cells tend to build up a large amount of the NADH & the reconversion to NAD and the cyclic reaction stops or slows down. Thereafter the incoming Acetyl-CoA starts getting diverted to conversion into TGs (triglycerides). Much of the TG is delivered to the blood supply but some of it is stored within the liver itself. Over a course of time the TG deposits cause fatty liver and in extreme cases cirrhosis. That apart, alcohol can cause serious vitamin deficiencies and a higher consumption increases the risk for cancers anywhere through the digestive tract as per a Canadian study. Moderately consumed, alcohol is “supposed” to have some benefits, especially for the cardio vascular system. Moderate has been defined by medical circles to mean about 45 ml/day. Stacking up a backlog for 6 days a week and consuming 350 ml on the 7th day is also not such a good idea. Wines are generally preferred as they are made by fermenting alcohol naturally and not by adding ethanol. Beers are carb heavy and therefore avoidable by diabetics. As an Ortho molecular nutritionist my final word on the subject is – Don’t drink, it IS toxic. As a moderate consumer I’d say – Drink very little, and only the good stuff. great article. very informative. how about adding the alcohols that are "better"? The post referred to “alcohol” as used in general everyday terms, meaning ethanol or alcoholic beverages. Technically, in chemistry, the term “alcohol” is used for any organic compound which has the central carbon atom bound to a functional hydroxyl (OH) group at one end. The other condition being that the carbon should be saturated, meaning that it should be bound with other atoms or groups of atoms at all the other 3 bonds. Carbon has 4 bonds, and none of them should be open. Very broadly speaking the suffix “ol” is used for alcohols. Substances having a functional hydroxyl group attached to carbon, may have names like cholesterol which would mean that technically it is an alcohol. Most non sugar sweeteners are also known as sugar alcohols for the same reason of functionality. These could be what you meant by “better” alcohol. Otherwise, I have mentioned that wine is preferable because of naturally fermented alcohol instead of added ethanol.